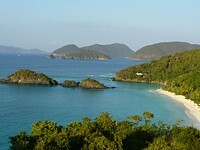 "The gemstone of the Caribbean". Larimar is indigenous to The Dominican Republic. It was discovered in 1978 by a Peace Corps volunteer who named it after his daughter Larissa and combined it with the Spanish word for the sea, Mar. Larimar is a Pectolite. The name comes from the Greek ‘Pectos’ meaning “well put together" it's color varies from light to deep blue capturing the most of our sky and Caribbean Sea. Tutu Much is more than just another jewelry store, established 10 years ago on St John their original designs will transport you to many worlds and exotic destinations. 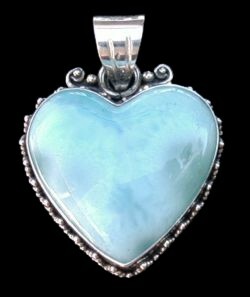 Larimar, the famous pale blue to sky blue variety of Pectolite is mined on one unique Caribbean mountain and found nowhere else in the world. It’s translucent, sky blue color is attractive and is quite popular among those who like polished stone jewelry.